The Nokia XL measures 141.4 x 77.7 x 10.9mm, larger than a typical 5" phone. It's a full inch taller and over half an inch wider than the 4" Nokia X. The 1" difference in screen diagonal should have blown up dimensions less than that, meaning the XL has thicker bezels. The 190g of weight is also going to be a serious issue - a 5.7" Samsung Galaxy Note 3 weighs only 168g. 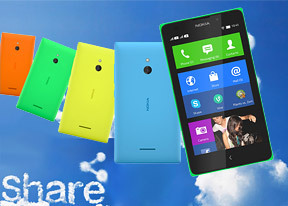 The Nokia XL wouldn't look out of place next to a Lumia 520 or an Asha 501. The phone uses elements from the design of both phones in several places, including both hardware and software. It's bigger than both, something that is instantly obvious in person. As we already mentioned, the screen bezels on the Nokia XL are thicker than those on the Nokia X or a typical 5" phone. Having grown used to large devices we didn't mind the size much, surprisingly even the 190g weight felt okay. Nokia typically makes heavier than average phones, but it has built itself a reputation for rock solid durability. The Nokia XL has a similar tough feel to it. Anyway, the front features a flat, black glass with the colorful polycarbonate of the back forming a thin border around the glass to give the phone a bit of character. The only button on the front is a capacitive back button similar to the recent Asha 50x phones and unlike a typical Android phone. The level of software customization means you don't need the Home and App switcher buttons, though that doesn't necessarily make them redundant. Above the screen, a 2MP front-facer is a first for the lineup - both the X and X+ forego the secondary cam. The earpiece, proximity and ambient light sensors are also above the screen. The display has the Glance Screen feature, similar to Lumia phones and Nokias of old (plus Motorola's Active Display). Basically, it keeps the display on but in a low power mode, so it displays a clock and notifications without burning through the battery. The back of the Nokia XL is made of soft touch polycarbonate, a long-standing Nokia trademark. It's a high quality material that we prefer over the plastic of certain older flagships. The covers are exchangeable, letting you customize your phone with the following colors: orange (the one we have), bright green, cyan, yellow, black and white. At the back is a 5MP autofocus camera with LED flash. It's a significant upgrade considering the Nokia X and X+ both have fixed-focus 3.15MP cameras with no flash. The video capture remains unchanged at 480p @ 30fps, however. At the bottom of the back is the loudspeaker. Under the battery cover is a disappointingly small 2,000mAh battery, which looks tiny compared to the bulk of the Nokia XL. In a couple of chapters we'll explore the battery life in detail. The card slots are below the back cover too - a microSD card slot and one or two microSIM card compartments. We have the dual-SIM version of the Nokia XL, though the device has a single-SIM version too. Dual-SIM Asha phones have a hot-swappable second SIM slot, but that's not the case with the Nokia XL. You have to power off the device to remove either card (the battery blocks the way). Having covered the front and back, what's left is the sides of the phone, which have a very traditional setup. There's a 3.5mm audio jack on top, microUSB port for data and charging at the bottom. The volume rocker and the power key are on the right-hand side. The power key is low enough to be easy to hit with your thumb, despite the overall height of the phone. Nokia also has a double-tap to wake feature, which is more convenient. It's quite accurate though we did see the phone wake a couple of times from accidental taps.